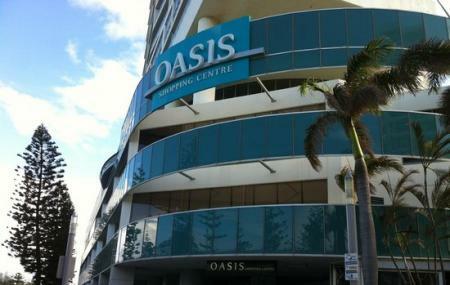 The Oasis Shopping Centre is located just a short stroll away from Broadbeach. The site boasts of over 100 speciality stores, premier restaurants and cafes. You’ll find stores selling beautiful Jewellery, fashionable clothing and apparels, beachwear and shoes. There is a section on ground floor for the perfume and cosmetics shoppers. The Oasis shopping centre also offers a medical centre along with health and wellbeing stores such as gyms, massage, physiotherapy and yoga classes. It is a shopper’s paradise; you’ll find almost everything at the stores here. The Oasis shopping centre boasts of a huge parking area. Over 1300 cars can be parked here, with first 3 hours available for free. The site is directly accessible to patrolled beaches. By Bus to Surf Pde at Broadbeach Mall. Bus no 705, TX2, TX3. How popular is The Oasis Shopping Centre? People normally also visit Dolphin And Whale Watching while planning their trip to The Oasis Shopping Centre.